Our family has had so much fun, and we have learned so much, by acting out Bible stories together! A child's natural love for action and drama provides a wonderful opportunity for teaching spiritual truths. Simple dramatizing can help children pay better attention to Bible reading, and can help them remember and understand stories better. Through stories, a child can see God's unchanging character, as well as the consistent consequences of man's decisions throughout history. And--drama gives an energetic body something to do! This book is a collection of ideas to inspire some simple story-acting in your family. 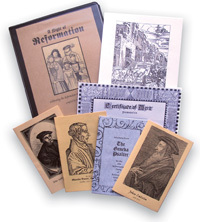 Scripture references and suggestions for dramatizing over 40 different stories. These are simple ideas--no scripts, no rehearsals--just quick, spontaneous family playtimes that help teach Scripture's truths. Our children always beg for more! Also includes ideas for acting out Bible stories with Legos, Play-Mobil, Fisher-Price "little people," building blocks, stuffed animals, dolls, and other toys. Get the Kindle eBook version from Amazon.com. Scripture quotations are from the King James version. 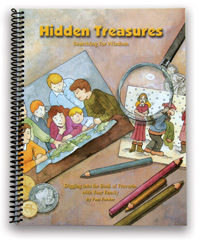 This short book gives reasons and ideas to dramatize Bible stories with your children. It gives simple ideas for costumes and props. These costume ideas and props are amazing! Easy and simple to do! I like that the book also gives ideas for different stories to dramatize. The ideas in this book are simple enough to come up with on your own, but having it all together in one place makes it nice and easy to have as a resource. 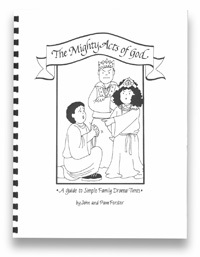 Use a drama in family devotions to liven up the routine!